CLICK for our FULL SIZE casino directory with high-resolution Casino Map Locator, Informative FAQ and Research Players Guide. LEGAL MINIMUM GAMBLING AGE in San Diego Indian casinos is either 18 or 21 years old, depending on the casino. See listings and websites below for casino-specific age restrictions. LEGAL MINIMUM DRINKING AGE to be served alcohol, the minimum drinking age in California is 21 years old. Some San Diego gambling casinos serve alcohol, some casinos do not serve alcohol. SMOKING is permitted inside most (if not all) Southern California casinos with various levels of management commitments to providing nonsmokers with healthy, smoke-free areas to eat, socialize, party, meet, and of course: gamble. IDENTIFICATION: Casino guests must present proper identification documents like a valid driver's license, passport, birth certificate, if they appear younger than 18 or 21 years of age (the legal age to gamble). TAXES: Winners of $1,199 or more in a California casino must show a federal Social Security card with proper photo ID and fill out a 1099 tax form to claim the prize so the Internal Revenue Service IRS can collect taxes on the jackpot winnings. EMPLOYMENT: If you need a job, the Casinos and resorts are some of the largest employers in their respective county, just click on their casino link and jobs links. AGUA CALIENTE CASINO RESORT SPA | The Coachella Valley's premier Poker Room. Home of The Show - concerts, comedy, and much more for casual players and high rollers. Try your hand at the best Blackjack games in Southern California plus Pai Gow, Three Card Poker, Mini-Baccarat and more. EVENT FACILITIES: Conferences; Meetings; Weddings, dramatic views of the San Jacinto Mountains. Truly spectacular. MINIMUM AGE TO GAMBLE: 21, guests must be 21 to enter the casino, younger guests may enter the Hot Water Casino restaurants if accompanied by an adult. BARONA VALLEY RANCH: The ideal place for the real player, Barona boasts the best Blackjack rules in the country with single- and double-deck games, high table limits (up to $10,000 and more), $25 video poker, and even $500 slots, chipless Blackjack. And with special player services like Club Barona (our award-winning player’s club), the Player's Lounge (our online player services area), and the Real Player's Hotline (direct access to VIP treatment), serious gamblers find all they need. Right here in San Diego. Right now at Barona Valley Ranch. BARSTOW CASINO AND RESORT is a proposed $160 million resort-casino project with the Los Coyotes Band of Cahuilla and Cupeño Indians. MINIMUM GAMBLING AGE: 21, guests must be 21 years or older to gamble in the Cahuilla Casino, minors may enter the restaurants if accompanied by an adult. COCOPAH RESORT Casino & Conference Center: Cocopah Resort...Your lucky day might be one spin away! Our beautiful Cocopah Casino in Yuma, Arizona features over 500 of today's newest slot machines, so you're always sure to find your favorite. You'll also want to take a seat at one of our 10 Vegas-style blackjack tables and visit our award-winning 250-seat bingo hall, where B10 could make you the next big winner! MINIMUM GAMBLING AGE: 21 years or older with proper ID to gamble. Under 21 may enter the Casino restaurants. FANTASY SPRINGS RESORT CASINO: Located in the beautiful Palm Springs area, Fantasy Springs Resort Casino offers all you need for a fun-filled getaway or complete destination vacation. Whether your fantasy includes luxurious hotel rooms, exciting Vegas-style gambling options, fabulous dining, world-class entertainment, golf or poolside lounging, you’ll find it all here. This 250-room Palm Springs hotel features brand-new luxurious rooms many with spectacular mountain views. The hotel rooms are four-star caliber with comfort amenities for both leisure and business travelers. Must be 21 or over to reserve accommodations in the hotel. MINIMUM GAMBLING AGE: 21, guests must be 21 or older to gamble (no minimum age to enter the casino-resort). GOLDEN ACORN CASINO & TRAVEL CENTER: The Golden Acorn offers special friendliness as players visit the "Luckiest Place on Earth". Customers have a choice of state of the art slot machines, 13 table games and 4 poker tables. Table limits vary, but, there is always something available for everyone. Video Poker enthusiasts can chose from over 45 machines. MINIMUM AGE TO GAMBLE: 18 years old, children may eat in the casino restaurants if accompanied by an adult. HARRAH'S RINCON CASINO AND RESORT: Welcome to Harrah's Rincon, the premier in San Diego Entertainment and San Diego Hotel Accommodations. At Harrah's Rincon, we can help you create the perfect San Diego vacation. Whether you're looking for traditional San Diego Casino Gambling or a unique entertainment experience, you'll find it at Harrah's Rincon. When booking your next San Diego Hotel Reservations, Remember Harrah's Rincon. MINIMUM AGE TO GAMBLE: 21, younger guests may eat in the restaurants with an adult. HAVASU LANDING RESORT CASINO: Enjoy state-of-the-art electronic gaming in our casino on the shore of beautiful Lake Havasu! Set in a desert landscape of awesome beauty, Havasu Landing Resort on the western shores of Lake Havasu is the center of attraction for outdoor recreational activities that bring thousands of visitors to the Chemehuevi Valley each year. EVENT FACILITIES: MARINA, Havasu Landing Marina, recreational activities include water skiing, boating, swimming, fishing, hunting, jet skiing, windsurfing, sightseeing and a myriad of enjoyable events in the area. HOLLYWOOD CASINO: Jamul Indian Village - A Kumeyaay Nation near San Diego, located in what is rapidly developing into one of this country's most exciting gaming regions, the proposed Jamul Casino boasts what may be considered the #1 location in Southern California. The casino is just off I-94 and a short 20-minute drive from downtown San Diego. 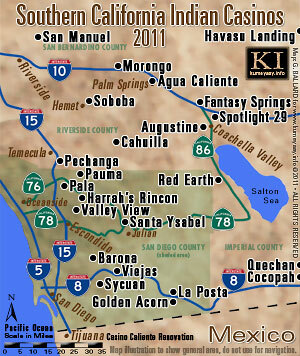 Which casino is closest to San Diego: Jamul? La Jolla Band of Luiseño Indians: The La Jolla Band of Mission Indians is proposing to build a casino and hotel on its Palomar Mountain reservation, according to an environmental study of the project. The proposal calls for a 480,000-square-foot gambling and hotel facility, according to the study. The proposed hotel would have 200 rooms with six separate villa suites and a parking structure...the proposed casino is expected to open in January 2012....MORE (link broken). LA POSTA CASINO: La Posta Casino lies on the La Posta Indian Reservation. The word "La Posta" refers to a meeting place. For centuries local people have met at the top of the hill for ceremonies and celebration. La Posta Band of Mission Indians desired to share their place with neighbors near and afar. Our casino will ensure that the top of the hill remains a meeting place for years to come. MINIMUM AGE TO GAMBLE: 21, younger guests may eat in the restaurant with an adult. The final environmental impact statement (PDF) for the proposed Manzanita Casino Project in Calexico has been made available for public viewing and comment. The Manzanita Band of Kumeyaay Indians’ project entails placing 60.8 acres into federal trust and later developed into a casino. MORONGO CASINO Resort Spa: Set at the foot of the beautiful San Gorgonio and San Jacinto Mountains, the Morongo Indian Reservation spans more than 32,000 acres and overlooks the vistas of the Banning Pass. LOCATION: Morongo Indian Reservation, Cabazon, CA. CASINO: 2,000 slots; 85 table games, Morongo Craps California-Style, Pai-Gow Poker, 4 Card Poker, 3 Card Poker, EZ Baccarat and Blackjack, Texas Hold’em, No Limit Texas Hold’em, Omaha and 7 Card Stud. GOLF COURSE: The Morongo Golf Club at Tukwet Canyon, a beautiful award-winning 36-hole facility formerly known as the East Valley Golf Club (phone: 877-742-2500). MINIMUM GAMBLING AGE: 18, you must be 18 years or older to gamble in the Morongo Casino with proper ID; you must 21 to rent a Morongo hotel room; children may be able to enter the Morongo Casino if accompanied by an adult. PALA CASINO SPA AND RESORT: Pala Casino - San Diego Resort and Spa is now AAA four diamond award winner. Find a great deal on the hotel stay and make your vacation at a beautiful Indian resort of Southern California. Pala Casino - San Diego Resort and Spa is the casino you want to visit. MINIMUM AGE TO GAMBLE: 21, you must be 21 or older to gamble at Pala Casino, younger guests may enter the casino with an adult to eat in casino restaurants. CASINO PAUMA: Casino Pauma... the Player's Oasis! Come enjoy the country club of San Diego casinos right here in North County San Diego. Over 35,000 square feet of gaming, table games, blackjack, slots, slot machines, blackjack, Pai Gow Plus, Stud, and Roulette Cards Craps, with Las Vegas-style buffets, dining, entertainment. MINIMUM GAMBLING AGE: 18 years or older with proper ID to enter the casino and gamble. Children may not enter the casino or restaurants. DINING: Catering to virtually every taste, the resort offers eight great places to eat including four gourmet restaurants - Paisano's, The Grotto, Kelsey's and The Great Oak Steakhouse. At Blazing Noodles, Pan-Asian cuisine tantalizes the taste buds. The Buffet offers a sumptuous all-you-can-eat buffet and The Pechanga Café serves breakfast, lunch and dinner, providing round the clock dining choices. RV/RESORT: Each of the resort’s 168 sites offers full electric (20, 30 and 50 amp), water, cable TV and sewer service. Of the 168 sites, there are 3 Luxury, 27 Premium, 113 Back-in and 25 Pull Through sites available. The Resort is internet friendly with wireless access available at each site. TRANSPORTATION: BUS SCHEDULE...just get on the free Pechanga bus at any number of regular points. MINIMUM GAMBLING AGE: 21 years or older to gamble. With an adult, persons under 21 may enter the Casino restaurants, shows and hotel. QUECHAN CASINO RESORT: Play Like a Pro  Quechan is one of the largest and most impressive gaming facilities in the Southwest. We are offering an incredible array of gaming options in a vibrant and sophisticated setting. This is the place where the excitement never stops. Quechan Casino Resort’s breathtaking design is Mediterranean-themed with tribal influences. Relax and rejuvenate in a Mediterranean Oasis created just for you! As a Quechan guest, you can cool off in our large pool, or sink into our invigorating whirlpool. If a brisk ride on a current in our Lazy River is more your style, come join us! MINIMUM GAMBLING AGE: 21, guests must be at least 21 years old to gamble. RED EARTH CASINO: At Red Earth Casino, When we say, "It's Where the Jackpots Are," we're not messing around! We're cranking out more jackpot winners per square foot than most any other property around. We know that when you come to play here, you've come with one thing on your mind: JACKPOTS! And best of all, there's a game for every kind of slot player at Red Earth; we're home to tons of your favorite games in all denominations. Choose from a fantastic selection of slots starting at just a penny to up to $5. Plus Red Earth has all of your favorite titles, multi-games, community games, and huge progressives. In fact, there's more than 4.6 MILLION DOLLARS IN PROGRESSIVE JACKPOTS ON OUR SLOT FLOOR, just waiting to be won! And at Red Earth, we prefer to set our machines on the loose side, so when you come out and play with us, you'd better be ready to play a little longer than you would at other area casinos! 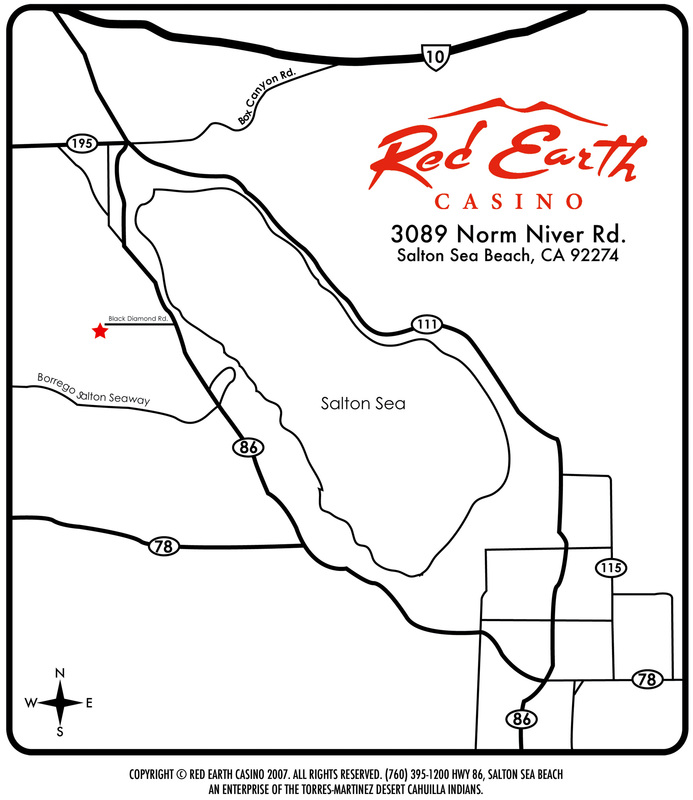 MINIMUM AGE: 21, visitors must be 21 or older to enter the Red Earth Casino. MINIMUM GAMBLING AGE: 21, guests must be at least 21 to enter the casino. SANTA YSABEL RESORT AND CASINO: Live Poker, Live Black Jack, Eagles Nest Slot Club, The Orchard Restaurant and Buffet. MINIMUM GAMBLING AGE: 21, younger children may enter Casino restaurants with an adult. SOBOBA CASINO: Nestled in the foothills of the San Jacinto Mountains, Soboba Casino is your one-stop headquarters for California gaming and entertainment. Soboba features 2,000 slot machines, over 20 table games, two restaurants, a 12,000 seat entertainment pavilion and one huge sports lounge, including a championship golf club. LOCATION: Soboba Indian Reservation, San Jacinto, Calif.
SPORTS COMPLEX: The Oaks at Soboba property consists of 480 acres, complete with hills, valleys, mountainous terrain, flat lands and hundreds of beautiful California Oaks. Our facility includes top of the line sports fields for baseball, softball, football, and many more. The Oaks at Soboba is proud to be the home for the Avengers Training Camp. MINIMUM AGE: 21, you must be 21 years or older to enter the Soboba Casino. MINIMUM GAMBLING AGE: 21, younger guests may enter the dining areas with an adult. VALLEY VIEW CASINO & HOTEL: The all-new Valley View Casino currently offers over 1,750 exciting slot machines; 18 table games including single-deck blackjack, double-deck blackjack and Pai Gow poker; delicious dining options including an award-winning buffet, the Black&Blue steakhouse and lounge, BLD's 24-hour café, Scoops gourmet ice cream shop, Sweets pastry and espresso bar, and Snax, a gourmet snack bar; the Main Stage bar with live entertainment; a new Players Club, a new high limit slot area, an Elite Lounge and a non-smoking casino and bar. Plans for further growth of the casino, including a hotel, are in the development stage -- SAN DIEGO'S FAVORITE . MINIMUM AGE: 21, you must be 21 years or older to enter the Valley View Casino. VIEJAS CASINO: Viejas is the place for slot players. We have all your favorites like Wheel of Fortune ®, Megabucks, Pot O' Gold and more! New games are being added regularly so keep an eye out for our new-release announcements. HOTEL: VIEJAS HOTEL features a pool and lounge area, a modern Fitness Center, a convenient, user-friendly Business Center, 99 luxury rooms, and 29 VIP suites. FAMILY ENTERTAINMENT VENUE: Viejas tribe has built a sprawling outlet mall across the street from their highly successful casino  VIEJAS OUTLET CENTER  including top name brand factory stores: Polo, Ralph Lauren, Nike, Vans, GAP, Guess, Coach, Chico's, Pacific Sunwear (to name a few of the 60 Viejas stores). The modern center features seasonal Native American-themed shows like Power of Nightfire, Splash Tracks and Ice Princess for live casino show entertainment, and an outdoor ice skating rink and a family bowling center: VIEJAS BOWL. SYCUAN CASINO AND RESORT: Choose your favorite gaming action Slots, Blackjack, Pai Gow, Poker, World Poker Tournament, or Bingo. Join San Diego’s best players reward program, Club Sycuan and receive valuable benefits, including discounts and cash back rewards. MINIMUM AGE: 18, Sycuan guests must be 18 or over to enter the Sycuan Casino, including Sycuan theaters and casino restaurants. PLEASE NOTE: Some casino logos, photos and text descriptions about the San Diego gambling casinos listed on this Indian casino guide may be copyrighted by the respective tribes and casino websites. Please CONTACT WEBMASTER if you would like to update your information or sponsor this page.